Eko is not from around here, and it shows. Born in a far-off land across vast oceans, Eko definitely stands out in a crowd. He is not overly tall, but his large black frame is heavily muscled. "Eko", in his native language, means "Big", and Eko is well-named. At age 15, Eko's tribe was involved with skirmishes with a neighbouring tribe. 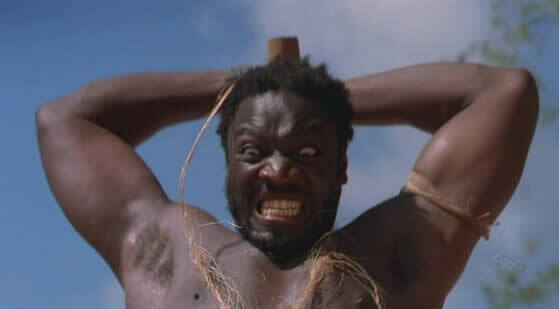 In the fighting, Eko's elder brother Ngobi was killed and zombified by the enemy tribe's witchdoctors. Later, as the fighting crescendoed, Eko was forced to kill his undead brother. The scars of the encounter still run deep. 6 months after his 17th Birthday, Eko's tribe was set upon by foreign slavers. Eko and many of his tribespeople were captured and shipped to a foreign land like cattle. Eko survived nearly 12 months of slavery before escaping. While on the run, he was taken in at a Monk's monastery high in the mountains. There, he learned that not all people in this strange new land are evil, while he further honed his mystic and martial prowess. Eko eventually left the monastery and settled in Scranton, working as a barman / bouncer at the local tavern - a role that he is particularly gifted at. While the Common tongue is not Eko's native language, he is a fast learner and his knowledge of the local language is improving rapidly. Eko is understandably rather distrustful in this strange new land. Even the flora and fauna is largely alien to him. Until recently, he had never come into contact with such animals as a horse or a cat. The land of Eko's birth is a harsh, arid place. Rainfall is rare and seasonal; shortly after the rains come dormant plants burst into vibrant but short life before being beaten back by the incessant sun and wind. Forests simply do not exist here. Small herds of antelope and wildebeest migrate with the water and flora, with small carnivores such as hyenas and great cats following in their wake. Insect life is about the only constant in this land, with great variety in species and size - large and giant insects and arachnids are not uncommon. Human populations in this land tend to be small, widely separated, tribal and nomadic. They too follow the seasonal ebbs and flows, migrating to and from a small number of traditional tribal sites as conditions dictate. The areas of land that a particular tribe claim as their own are often extraordinarily large. Clashes between tribes are common, and are often triggered by conflict over scarce resources. Tribal warparties will often run for days on end to war with a neighbouring tribe, and after the fight will immediately turn around and run back again. The nomadic tribe that Eko comes from would be considered "savage" by traditional standards. Metal is very rare; typical weaponry used by the tribe include clubs, spears and bone knives - when weapons are used at all. The tribe prizes hand-to-hand combat with a bare minimum of equipment - ritualistic combat is often performed naked with no weapons. Missile weapons are very rare. The best warriors are riddled with scars that are worn as badges of honour. Males born into the tribe are given a name which stays with them until their 14th Birthday, when they undergo a ritualistic rite of passage by personal combat - against other tribemembers, or occasionally against beasts such as lions, giant insects or scorpions. Those that prove their mettle are accepted into the tribe as adult warriors and given a new name; those that do not succeed retain their birthname, are treated as second-class citizens and relegated to less glamorous tasks. This process of trial is often repeated at a warrior's other life stages - when becoming a leader, witchdoctor or shaman, for example. It is not uncommon for an aged warrior to have had several names. Fergus: He likes bashing out the teeth of people he has killed to add their teeth to his club! A real charmer! Eko is built using the AD&D 2nd Edition Skill & Powers Character Points system.